"We've come a long way from the Prime Minister's exploding cake. Or have we?" 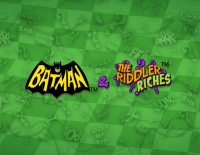 Batman And The Riddler Riches is a 3 rows, 5 reels game in which you play all 243 ways. The theme for the game is the old Batman television show. The symbol animations are only done when you win a large amount, or when you win during the free spins bonus, and then, only the major symbols animate. The minor symbols just swing when you get a winning combination. The game offers 2 different types of free games and a picking bonus. During my session, I only got to see the picking bonus and the multiplier free games. I never got to see the sticky wild free games. 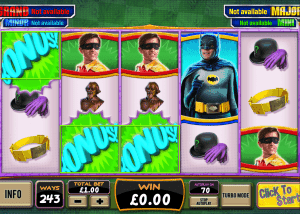 The game is a ways game that also offers tumbling reels when you get a winning combination. I personally find the old Batman television show to be super cheesy, and I cannot sit down to watch a single episode to its conclusion, but if you are nostalgic for the old Batman show, perhaps you will find this game aesthetically pleasing. Personal judgments about the old show aside, this game does have its appeal. You are always eligible to win 1 of 4 progressive jackpots. The wins aren’t very big, but they are frequent, so if you are looking to prolong your time on device, this game seems to deliver. I liked the picking bonus. I like pick bonuses where you pick until you match an award. My reason for liking these bonuses is because I get something to do as the player, as opposed to watching reels spin again, and again. I am not sure how much luck had to do with the number of bonus triggers I saw, but I got 4 triggers, and from each trigger, I got very high awards. Finally, although I spent the vast majority of my session on the negative side of the return, my session ended well positive. The help screens are concise, and complete. The game is rather boring to look at. The background is a checkerboard with question marks (Riddler theme). It is not easy to decipher how much your bet multiplier is. You always play 243 ways, and the unit bet is 25 cents. I was betting a Euro on each game, so my multiplier was 4. Meaning that if I won a combination that paid 10 times my bet multiplier, I would get 40 cents. In the old show, Robin used to always exclaim to Batman: “Holy such, and such, Batman…” On the top of the game board, from time to time you will see a phrase like: “Holy Jackpots, Batman” which just caused me to roll my eyes. There was one particular idiosyncracie that I did not like. I never got bonus symbols after a tumble, which leads me to believe that after combinations are evaluated, the replenishing pool is different from the pool that originally fills the board. To further strengthen my belief, I noticed that if there was any win at all, and the original board contained bonus symbols, the bonus symbols would always be removed alongside the winning symbols, unless there was a bonus trigger, in which case they remained on the board until the rest of the wins ran out, then I’d get the bonus. 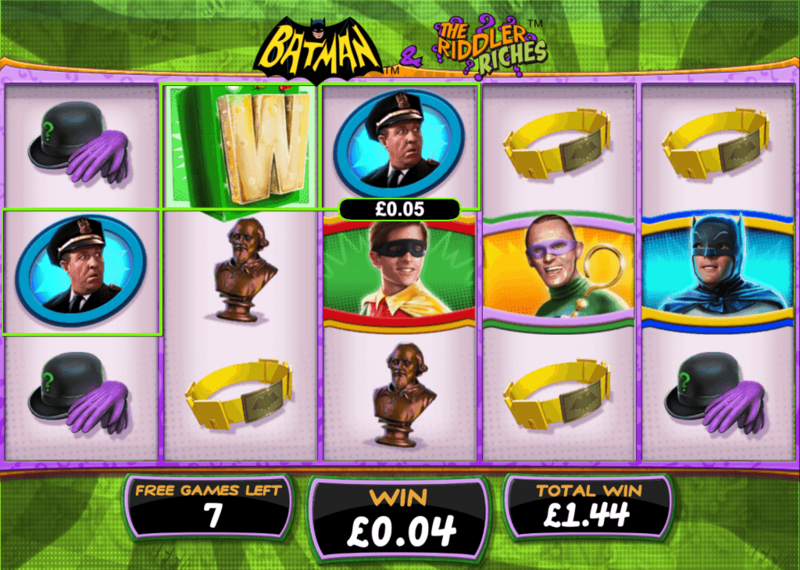 I triggered the Riddler Wheel Bonus 4 times. 2 of the 4 times, I won the picker bonus. I won 40 Euros my first time around, and I won 80 Euros the second time around. Considering that I was betting 1 Euro per game, each of these wins is very generous. 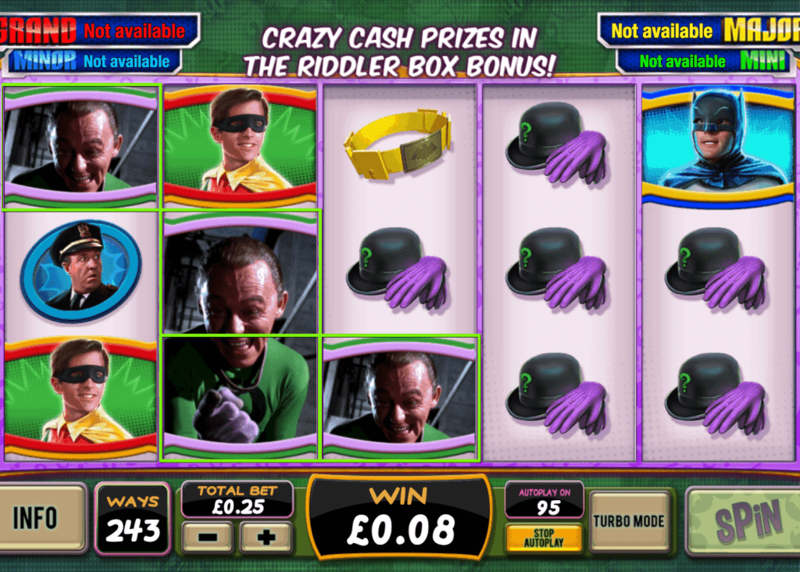 The other two times I triggered the Riddler Wheel Bonus, I received multiplier free games. The first time around, I won 33.16 Euros, and the second time around I won 159.04 Euros. Once again, very nice wins. I played 500 games at a Euro each, and I ended up 86.52 Euros ahead for an observed RTP of 117% for my session. As you can see there are some pretty weighty wins in those bonuses which were nice and gave you the motivation to keep spinning for another bonus just in case. 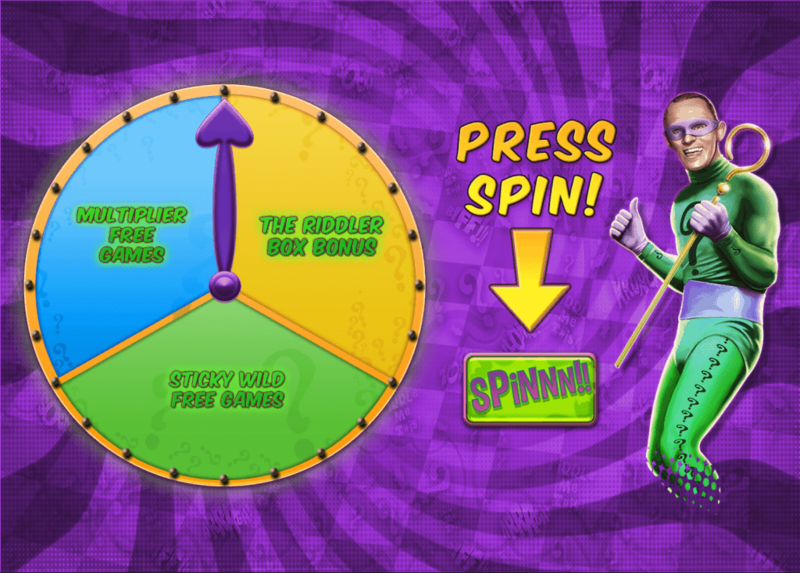 An interesting stat was that during the playthrough of 500 spins the mystery spins in the base game triggered 10 times which gives roughly a 1 in 50 trigger rate. Again it was just enough to keep the bank roll running. 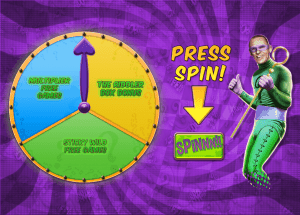 The features of this game are the 243 ways with tumbling reels for the base game. The game also contains a feature in which you get several cells on the board with mystery symbols. These mystery symbols all turn into the same symbol after the spin, and then the board is evaluated. I find these mystery symbols to be very anticlimactic. You get moving boxes with a question mark before the rest of the board fills up, and after the board fills up, they turn into a regular symbol, which is often not a symbol that creates any wins, although obviously, sometimes it does, but to me, this doesn’t seem any different from having the symbol there from the beginning. 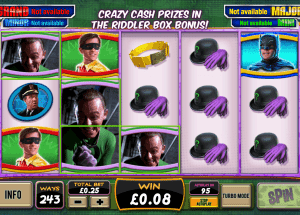 In the Riddler Bonus Box feature, the player is asked to select from 1 of 12 boxes one at a time until he or she matches 3 numbers. The player is given 2 sets of 12 boxes. The first set of boxes is to determine the award to be paid, and the second set of boxes is to determine the multiplier. It’s a pretty standard pick bonus to be honest with very little in the way of window dressing. During the Multiplier Free games, reel tumbles are called “waves”. During the first wave, you have a 1x multiplier. If you get past the first wave (By winning something), then you get a 2x multiplier. On the third wave you get a 3x multiplier, and if you win on the third wave, the multiplier goes to 5x, and stays there, until your winning waves stop, then the multiplier goes back down to 1 for the next spin. I never got to see the sticky wilds free games, which is a shame. The description of the bonus seems clear enough, which leaves me with a bone to pick. The wilds land on the board and stick for 3 waves. I am guessing that if the symbol below a wild is involved in a winning combination, the wild sitting on top of the symbol will drop after the below symbol disappears. My complaint is that after the third wave, all sticky wilds are removed. In other words, even if the wild is not in a winning combination after the third wave, you lose the wild. As with so many licence tie-ins, it never really feels like the design team did anything other than producing another production line video slot and apply the Batman paint to it. With source material so strong and varied you could have really gone to town here and built some really nice thematic bonuses with progressive pick elements…After-all you step into the shoes of the caped crusader and you have a wealth of villain material to utilise. I was hoping that was a slot to test the water before the subsequent titles came through, but looking at those they seem very much ‘run of the mill’ offerings. In conclusion, the game is not very visually appealing which is a shame given the licence. The bonuses are nothing new but I do think frequency and high pays help to make up for the lack of creativity here. 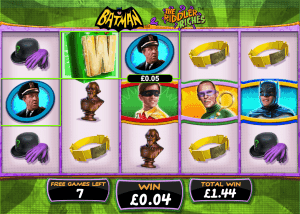 As you can see from my play session, the maths is such that it makes your money last a decent amount of time and you can play a long time in this slot, especially if you don’t commit a large amount on each game; the only question is, do you want to?